Our Mission and Philosophy in being a Cabinet Fronts Supplier | ACS, Inc. Focusing on LEAN Principles and Ethical Business Relationships we strive to be the premier source of Cabinet Fronts in the Southeast. Atlanta Cabinet Shop (ACS) specializes in custom component fabrication, including door and drawer fronts. We sell business to business. Casework, woodworking and millwork shops come to us for fast, reliable service and the highest quality custom components available. Atlanta Cabinet Shop wants to be your partner in progress. Our work cell approach to production allows us to mate our state-of the-art facility and equipment with highly skilled team players. 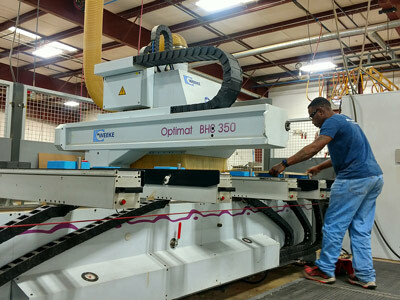 Our unique, easy-to-use online ordering platform coupled with LEAN principals in every facet of the business, means you get precision custom components with short lead times. Our customers profit by focusing on the skilled work they do best. We invite you to visit our state-of-the-art manufacturing facility located just north of Atlanta at 1885 Enterprise Drive in Buford, Georgia, or take a shop tour through our online picture gallery. Provide our customers with an easy ordering experience through better technology. Deliver the highest quality products, with the best lead times in the industry. Provide our staff with the best technology and training available, and empower them to be their best. We will compensate them accordingly, and provide a clean, safe and efficient work environment. Listen carefully to our customers, staff, and suppliers, using the information to build a better business. Conduct business on the highest ethical plane, dealing fairly with our customers, staff and suppliers. Make a profit, but not at the expense of any of the above principles or anyone's quality of life. Pursue excellence in all that we do, through continuous improvement. We promote a culture of continuous improvement. Improving our processes from one day to the next is at the heart of our efforts, and LEAN manufacturing methods play an important role in refining our manufacturing processes. We start each workday with a "3-S" process (Sweep, Sort, Standardize), creating a high-performance environment in both our office and shop floor. This ensures that everything stays organized, helps to reduce errors, and allows us to work efficiently and effectively. The software and machinery we utilize are cutting-edge, designed specifically for panel processing. We are always searching for new technology that increases our competitive edge. In fact, our new Zero edge capabilities are a perfect example.